Eruptions at Vailulu'u were recorded in 1973. An earthquake swarm in 1995 may have been related to an eruption from the seamount. Turbid water above the summit shows evidence of ongoing hydrothermal plume activity. Vailulu'u may breach the surface of the ocean and officially become an island if eruptions at high rate continue. The seamount was first discovered in 1975 after earthquake activity was noted in the area and was originally known as either Rockne Volcano or Fa'afafine seamount. The name Vailulu'u refers to a sacred rain that supposedly fell with every gathering of the last king of Samoa; it was assigned by Samoan high school students in 2000. The Nafanua cone is named after a Samoan war goddess Nafanua. Today the seamount is part of the National Marine Sanctuary of American Samoa. Vailulu'u is located east of American Samoa; the easternmost island Ta'u is located 43 kilometres (27 mi) west of Vailulu'u. Even farther west lie Ofu-Olosega and Muli, while Malumalu Seamount is located south of Ofu-Olosega. 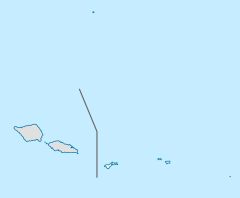 Rose Atoll and Malulu Seamount are located southeast from Vailulu'u. Vailulu'u is a conical seamount and reaches a depth of 593 metres (1,946 ft) and features a 2 kilometres (1.2 mi) wide and 0.4 kilometres (0.25 mi) deep crater; the shallowest part of the seamount is located on the western crater rim which has a scalloped appearance. Two additional summits and three breaches can be found in the crater rim; the deepest breach lies in the southeast and is 795 metres (2,608 ft) deep. The seamount has a star-like shape, with two prominent ridges east and west and a somewhat less prominent ridge south of the volcano, and also features smaller ridges at its foot and amphitheatre-shaped scars from landslides. The total volume of the volcano is estimated to be about 1,050 cubic kilometres (250 cu mi) and its size height above the seafloor is comparable with that of major isolated volcanoes such as Fuji although much smaller than compound volcanic islands such as Hawaii. The seafloor around Vailulu'u lies at about 5 kilometres (3.1 mi) depth; the foot of the seamount has a diameter of about 35 kilometres (22 mi) and a saddle at 3,200 metres (10,500 ft) depth connects it to Ta'u. A 300 metres (980 ft) high cone in the crater bears the name Nafanua and formed in 2004 in the western half of the crater. Prior to the formation of the cone, the crater contained several pit craters and it is possible that once the crater was occupied by a higher cone, which might have risen to shallow depths. The Nafanua cone consists mostly of pillow lavas. Hydrothermal vents are found at a number of sites within the crater and with various characteristics, including high and low temperature vents; the bulk of the venting for example occurs through the "Northern Moat Hydrothermal Complex" and reaches temperatures of 80 °C (176 °F) while the "South Wall Fe Chimney" system vents water with temperatures of 20 °C (68 °F) in massive vents. The hydrothermal activity influences the waters within the crater, making them turbid and warmer than the water in the free ocean. Low temperature hydrothermal vents are found on the western ridge of Vailulu'u as well. The hydrothermal fluids vented at the Northern Moat Hydrothermal Complex appear to be rich in sulfides, and droplets of carbon dioxide have been observed in the vented fluids. Particles emitted by the vents in some places reduce visibility underwater to less than 2 metres (6 ft 7 in), and the vented fluids are subject to complicated buoyancy, ocean current and mixing processes once they enter the seawater. The total flow estimated at about 0.13 cubic kilometres per day (1,500 m3/s). The total power of the hydrothermal system is estimated to be 760 -610 megawatts and it forms substantial hydrothermal plumes in the crater; the altered water extends to some distance from the volcano. Vailulu'u lies at the eastern end of the Samoan volcanic chain and is considered to be the present-day location of the Samoa hotspot; this interpretation is based on both the position of the seamount and the isotope ratios of rocks taken from it. Young ages have also been observed on Malumalu Seamount, implying that the hotspot is currently feeding both volcanoes and forming two separate volcanic chains. These two volcanoes are the endpoints of two separate volcano lineaments in the Samoa islands. 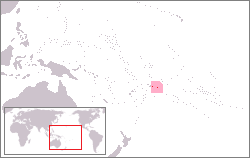 Samoa is located just northeast of the northern corner of the Tonga Trench, where the Pacific Plate is subducting. This close location to the trench is probably the reason why the older volcanic islands all display recent volcanic activity, such as in 1905 - 1911 on Savaii and originally led to proposals of a non-hotspot origin of the Samoa islands. Beyond this, islands form an eastward trend and show evidence of age progression which has been interpreted as reflecting an age progressive chain of volcanoes that begins at Vailulu'u and at Malumalu Seamount. The Malulu Seamount and Rose Island east of Vailulu'u do not appear to relate to the Samoa hotspot system, while on the other side of the volcanic chain are the seamounts Lalla Rookh Bank, Combe Bank and Alexa Bank that are older products of the Samoa hotspot. The origin of the Samoan volcanic chain has been explained with either a hotspot influenced by the Tonga Trench or by cracking of the Pacific crust; today the preferred theory is that the Samoan chain is a hotspot-generated volcanic chain while the "anomalous" younger volcanism is produced through an interaction between the islands and the Tonga Trench and a neighbouring transform fault. This hotspot is under the influence of the mantle flows triggered by the Tonga Trench, which distort the rising plume and also changes its upwelling flux. This interaction has only begun recently. Alkali basalts and picrites have been dredged from the volcano. The volcanic rocks on Vailulu'u reflect a magma suite called "EM2" although there are noticeable differences between the geochemistries of various volcanic units at Vailulu'u. Evidence of hydrothermal alteration includes quartz in rock samples. Iron oxide chimneys with sizes emasured in centimetres to metres have been formed by low temperature hydrothermal venting. A total mass flux of 5.5 tonnes per day (0.063 long ton/ks) of manganese has been estimated. Hydrothermal sulfide and oxide deposits may become targets for mining. Various bacteria live on Vailulu'u, including in microbial mats and on basalts, and which are related to bacteria from Tangaroa Seamount in the Kermadec Ridge, Loihi in Hawaii and in the East Pacific Rise. A number of mostly pigmented yeasts and other fungi have been identified in deposits from Nafanua and in iron mats and might play important roles in the ecosystems of Vailulu'u. Microbial mats with thicknesses of 2–4 centimetres (0.79–1.57 in) but possibly thicker in depressions have been found at Vailulu'u, they often contain iron hydroxide/iron oxide deposits; the widespread production of siderophores by microorganisms may not only serve to make iron available to them but also to reduce the entrapping of the organisms within iron oxides. Sulfur, manganese and iron may serve as electron donors in metabolism at Vailulu'u; hydrogen sulfide, iron, manganese and methane-oxidizing proteobacteria have been encountered. In addition, demosponges have been observed in breaches of the crater rim and presumably rely on incoming nutrient rich water from the ocean, while crinoids, gorgonians, ophiuroids and sponges have been found on the western rift zone of Vailulu'u. In non-hydrothermal areas, echinoderms, octocorals and sponges dominate the surfaces, and in summit areas crabs, eels, octocorals and octopi have been observed in the summit areas. the eel populations have given that part of the volcano the nickname "Eel City" and the eels subsist on food transported by ocean currents such as crustaceans. There are differences between the animal fauna in various parts of the volcano. For example, the oxygenated waters and availability of shrimp as food source attract eels to the summit of Nafanua while the crater floor displays a high animal mortality and is called the "moat of death"; polychaetes feeding on dead fish have been found on the crater floor. Likewise, the availability of oxygen there for respiration is very low unlike at the summit of Nafanua. Vailulu'u is an active volcano, with earthquakes, volcanic eruptions and hydrothermal activity recorded. In particular, the seamount is a site with common earthquakes in this otherwise mostly aseismic part of the Pacific Plate and away from the earthquakes of the Tonga Trench, including an average 4 earthquakes per day. Seismic swarms were observed in 1973 and 1995 and an earthquake swarm took place in 2000; the hypocentres appear to coincide with the hydrothermal areas and the earthquakes correlate to the southeastern ridge, which is a rift zone. Disequilibria in thorium and uranium isotopes of rocks samples taken from the seamount indicate that Vailulu'u was frequently active in the last 8,000 years and that eruptions within the summit crater took place in the last hundred years. Dredge samples showed fresh rocks; radiometric dating produced ages of less than ten years according to 1984 and 1999 publications. The seismic swarm in 1973 appears to a major submarine eruption. The last eruption between 2001 and 2004 went unobserved and formed the Nafanua volcanic cone but in general the shape of the volcano has not changed much over time. Repeated eruptions like the one that formed Nafanua might make Vailulu'u emerge from the sea in a few decades, however. The summit of Vailulu'u is shallow enough that explosive eruptions with impact on coastal communities and ships may occur. Furthermore, isostatic effects from the growth of the seamount may have altered shorelines on Tutuila. Broken pillow lavas, colored red by iron oxide, inside Vailulu'u crater. ^ a b c d e f g h i j Connell et al. 2009, p. 598. ^ a b Hart et al. 2000, p. 3. ^ a b c d Hart et al. 2000, p. 5. ^ Young et al. 2006, p. 6453. ^ Sudek, Mareike. "Seamounts and Their Role in the Life Cycle of Species". NOAA. Retrieved 8 February 2019. ^ a b c d e Sudek et al. 2009, p. 582. ^ a b Sims et al. 2008, p. 3. ^ a b c d e Workman et al. 2004, p. 5. ^ a b c Koppers et al. 2010, p. 164. ^ a b Sudek et al. 2009, p. 583. ^ a b c d Hart et al. 2000, p. 6. ^ Staudigel et al. 2004, p. 3. ^ a b Konter et al. 2004, p. 2. ^ a b c Connell et al. 2009, p. 599. ^ a b Young et al. 2006, p. 6449. ^ a b Young et al. 2006, p. 6448. ^ Staudigel et al. 2004, p. 19. ^ a b c Young et al. 2006, p. 6450. ^ Hart, S. R.; Staudigel, H.; Workman, R.; Koppers, A. a. P.; Girard, A. P. (2003). "A fluorescein tracer release experiment in the hydrothermally active crater of Vailulu'u volcano, Samoa". Journal of Geophysical Research: Solid Earth. 108 (B8): 9. Bibcode:2003JGRB..108.2377H. doi:10.1029/2002JB001902. ISSN 2156-2202. ^ Hart et al. 2000, p. 10. ^ Sims et al. 2008, p. 13. ^ a b Sims et al. 2008, p. 14. ^ a b Koppers et al. 2011, p. 3. ^ a b c Konter et al. 2004, p. 3. ^ a b Hart et al. 2004, p. 38. ^ Sims et al. 2008, p. 2. ^ Sims et al. 2008, p. 20. ^ Hart et al. 2004, p. 52. ^ Workman et al. 2004, p. 9. ^ Sims et al. 2008, p. 6. ^ Workman et al. 2004, p. 6. ^ Hein, James R.; McIntyre, Brandie R.; Piper, David Z. (2005). "Marine Mineral Resources of Pacific Islands - A Review of the Exclusive Economic Zones of Islands of U.S. Affiliation, Excluding the State of Hawaii". U.S. Geological Survey Circular 1286: 10. Retrieved 2019-02-08. ^ Sudek et al. 2009, p. 592. ^ Connell et al. 2009, p. 601. ^ Connell et al. 2009, p. 604. ^ Sudek et al. 2009, p. 581. ^ Sudek et al. 2009, p. 590. ^ a b c Sudek et al. 2009, p. 593. ^ a b c Koppers et al. 2010, p. 165. ^ a b Young et al. 2006, p. 6451. ^ Young et al. 2006, pp. 6451-6452. ^ "NOAA Ship Okeanos Explorer: 2017 Expeditions". NOAA. Retrieved 8 February 2019. ^ Young et al. 2006, p. 6452. ^ a b Konter et al. 2004, p. 4. ^ Konter et al. 2004, p. 14. ^ a b c Koppers et al. 2011, p. 5. ^ Sims et al. 2008, p. 12. ^ Sims et al. 2008, p. 21. ^ Hart et al. 2000, p. 7. ^ Hart et al. 2000, pp. 5-6. ^ Kennedy, David M.; Marsters, T. Helene; Woods, Josephine L. D.; Woodroffe, Colin D. (1 March 2012). "Shore platform development on an uplifting limestone island over multiple sea-level cycles, Niue, South Pacific". Geomorphology. 141-142: 214. doi:10.1016/j.geomorph.2011.12.041. ISSN 0169-555X. Connell, Laurie; Barrett, Anne; Templeton, Alexis; Staudigel, Hubert (30 November 2009). "Fungal Diversity Associated with an Active Deep Sea Volcano: Vailulu'u Seamount, Samoa". Geomicrobiology Journal. 26 (8): 597–605. doi:10.1080/01490450903316174. Hart, S. R.; Coetzee, M.; Workman, R. K.; Blusztajn, J.; Johnson, K. T. M.; Sinton, J. M.; Steinberger, B.; Hawkins, J. W. (30 October 2004). "Genesis of the Western Samoa seamount province: age, geochemical fingerprint and tectonics". Earth and Planetary Science Letters. 227 (1): 37–56. doi:10.1016/j.epsl.2004.08.005. ISSN 0012-821X. Hart, S. R.; Staudigel, H.; Koppers, A. a. P.; Blusztajn, J.; Baker, E. T.; Workman, R.; Jackson, M.; Hauri, E.; Kurz, M. (2000). "Vailulu'u undersea volcano: The New Samoa". Geochemistry, Geophysics, Geosystems. 1 (12): n/a. Bibcode:2000GGG.....1.1056H. doi:10.1029/2000GC000108. ISSN 1525-2027. Konter, J. G.; Staudigel, H.; Hart, S. R.; Shearer, P. M. (2004). "Seafloor seismic monitoring of an active submarine volcano: Local seismicity at Vailulu'u Seamount, Samoa". Geochemistry, Geophysics, Geosystems. 5 (6): Q06007. Bibcode:2004GGG.....5.6007K. doi:10.1029/2004GC000702. ISSN 1525-2027. Koppers, Anthony; Staudigel, Hubert; Hart, Stanley; Young, Craig; Konter, Jasper (1 March 2010). "Spotlight: Vailulu'u Seamount". Oceanography. 23 (1): 164–165. doi:10.5670/oceanog.2010.80. Koppers, Anthony A. P.; Russell, Jamie A.; Roberts, Jed; Jackson, Matthew G.; Konter, Jasper G.; Wright, Dawn J.; Staudigel, Hubert; Hart, Stanley R. (July 2011). "Age systematics of two young en echelon Samoan volcanic trails". Geochemistry, Geophysics, Geosystems. 12 (7): n/a. doi:10.1029/2010GC003438. Sims, Kenneth W. W.; Hart, S. R.; Reagan, M. K.; Blusztajn, J.; Staudigel, H.; Sohn, R. A.; Layne, G. D.; Ball, L. A.; Andrews, J. (2008). "238U-230Th-226Ra-210Pb-210Po, 232Th-228Ra, and 235U-231Pa constraints on the ages and petrogenesis of Vailulu'u and Malumalu Lavas, Samoa". Geochemistry, Geophysics, Geosystems. 9 (4): n/a. doi:10.1029/2007GC001651. ISSN 1525-2027. Staudigel, H.; Hart, S. R.; Koppers, A. a. P.; Constable, C.; Workman, R.; Kurz, M.; Baker, E. T. (2004). "Hydrothermal venting at Vailulu'u Seamount: The smoking end of the Samoan chain". Geochemistry, Geophysics, Geosystems. 5 (2): n/a. Bibcode:2004GGG.....5.2003S. doi:10.1029/2003GC000626. ISSN 1525-2027. Sudek, Lisa A.; Templeton, Alexis S.; Tebo, Bradley M.; Staudigel, Hubert (30 November 2009). "Microbial Ecology of Fe (hydr)oxide Mats and Basaltic Rock from Vailulu'u Seamount, American Samoa". Geomicrobiology Journal. 26 (8): 581–596. doi:10.1080/01490450903263400. Workman, R. K.; Hart, S. R.; Jackson, M.; Regelous, M.; Farley, K. A.; Blusztajn, J.; Kurz, M.; Staudigel, H. (2004). "Recycled metasomatized lithosphere as the origin of the Enriched Mantle II (EM2) end-member: Evidence from the Samoan Volcanic Chain". Geochemistry, Geophysics, Geosystems. 5 (4): n/a. doi:10.1029/2003GC000623. ISSN 1525-2027. Young, Craig M.; Zierenberg, Robert; Templeton, Alexis S.; Tebo, Bradley M.; Pietsch, Theodore W.; Lee, Ray; Konter, Jasper; Koppers, Anthony A. P.; Jones, Daniel (2006-04-25). "Vailulu'u Seamount, Samoa: Life and death on an active submarine volcano". Proceedings of the National Academy of Sciences. 103 (17): 6448–6453. Bibcode:2006PNAS..103.6448S. doi:10.1073/pnas.0600830103. ISSN 0027-8424. PMC 1458904. PMID 16614067.